Hi. Welcome to Five Songs. March’s full moon is called the Worm Moon for some reason (though some indigenous tribes call it the Wolf Moon). And Fresno had a huge and wonderful full moon the last two nights. And it got me looking for “Hey There Moon” by Fresno native son David Seville (aka Ross Bagdasarian, creator of Alvin & the Chipmunks). Of course, now that the moon has passed full, I find it, buried in a YouTube of seven Seville songs. Here you go. And there’s a sixth song because, in my subliminal quest to uncover the secret history history of rock’n’roll, I realized at the last minute some subtle similarity between this Nick Cave song that was stuck in my head this week and one of my favorite ’60s nuggets, “Falling Sugar” by The Palace Guard. And I posted it twice because it was so niceI wanted to post their live TV video from ’66, and the sound was horrible, so I put that up along with a much better digital version with no video. And one more deliberate choice this week: This morning, I woke to the news of the death yesterday of Jimmy Ellis, the lead voice of The Trammps. Their most famous and most enduring song is “Disco Inferno,” but the first tune I think of is the first song I heard of theirs, three years before, as a high school freshman. And Graham Parker did a pretty good version of “Hold Back the Night” a couple years later, on “The Pink Parker” EP. And the song, associated with the Philly soul and early disco scenes, grew legs thanks to the passion of the English Northern soul fanatics. Since it’s the morning as I put this together, since Jimmy died from Alzheimer’s and since we all have to come to grips with the eventual darkness, I thought it was an appropriate song. It’s March 2nd, but it’s not too early to look ahead, so Five Songs this week comes with a little extra spring in its step. And it makes for a hell of a wakeup call on a Friday. Enjoy! 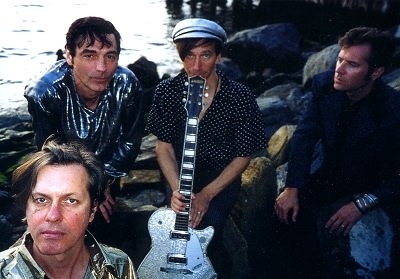 The Fleshtones, 2001. Back then, they'd only been at it 25 years. Front: Peter Zaremba. Back, from left: Bill Milhizer, Keith Streng and Ken Fox. Photo by Anne Laurent. Editor’s note: Once in a while, music writers are lucky enough to get the chance to write about their favorite musicians and bands. I was lucky enough to have been able to do interviews/features with Brian Wilson and the band that’s been my favorite since 1984, The Fleshtones. This story ran as the centerpiece of the Friday, March 23, 2001 Weekend section of the New Haven Register. They were playing the next night as part of a Junk Culture Festival at the late downtown club the Tune Inn, and had recently released the album “Solid Gold Sound” on Blood Red, a small indie label out of Portland — run by a guy who worked, if I remember right, full-time as a nurse to fuel his passion for music. And they’re still going, nearly 36 years after Peter Zaremba and Keith Streng played their first gig, at CBGB. The early days of CB’s. Before punk was punk. The piece comes to me thanks to the good graces of one Jay Mucci, a fan of my music writing since my Waterbury days — and a big music fan, period. Jay has a blog called The Beat Patrol, where you can find countless music stories and reviews, by me and a lot of other people. Jay was kind enough to have included this on his site. You’d think they would have quit a long time ago. Instead, The Fleshtones just released their 16th album, Solid Gold Sound, on Blood Red, a Portland, Ore., indie label. They’ll also return to the Tune Inn Saturday night to play in the club’s two-night, 20-band Junk Culture Festival, going on at 9:30. So why are they doing this? They’re not getting rich — or younger. Why put themselves through the grind, long past the point where others’ hearts would have shattered? The answer can be easily seen at one of their shows. Like all the Whos down in Whoville, singing around where the Christmas tree once stood, The Fleshtones’ hearts haven’t been tarnished by material disappointments. Bassist Ken Fox, the junior member, with 11 years in The Fleshtones since leaving Jason & the Scorchers, still has as much fun as he did when he was a fan of the band in the mid-’80s. They just love what they do.